Current methods for locating new sources of uranium are time-consuming and expensive, often requiring governments and mining companies to fly planes over large swaths of lands in remote areas. With the wide variety of Earth observation data now easily accessible, allowing us to detect more and more from space at a low cost, and the recent increases in computers’ processing power, which made it possible to sort through the large amounts of data necessary for analysis in a short time, satellites have become an extremely attractive way to help detect features in remote areas. As a Ph.D. candidate in the UAB School of Engineering, Reda El-Arafy, a geologist by training and now an assistant professor of nuclear geology and remote sensing with Egypt’s Nuclear Materials Authority, worked with mentors Sarah Parcak and Scott Brande to find a more cost-effective way – through sensor systems on Earth-observation satellites – to identify promising targets for uranium exploration in the southwestern Sinai desert. El-Arafy first selected 30+ areas in the southwestern Sinai in which uranium-rich deposits were suspected. A critical component of the study was to collect geological samples throughout the area for which advanced satellite imagery was available. Multi-spectral sensors can capture data in several spectral bands, with some sensors recording up to 10 different bands. Hyper-spectral sensors however record data in much narrower spectral bands, allowing us to focus our attention in very small specific parts of the electromagnetic spectrum. 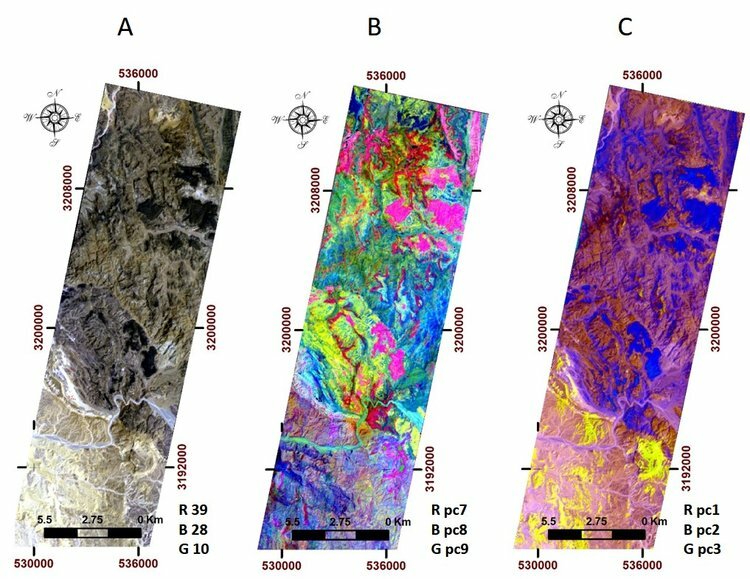 This is why El-Arafy chose to study data from the Landsat-8, ASTER, and HYPERION satellites, as minerals of interest in this study are highly recognizable in the short-wave infrared and the thermal-infrared spectral bands detected by multi-spectral and hyper-spectral sensors onboard. To help with El-Arafy’s research, Egypt’s Nuclear Material Authority also shared data from a gamma-ray spectrometer they flew over the study area, which provided additional information for ground truth interpretation. This new set of data was overlain on satellite images to help identify anomalies or variations in the satellite sensor data and to later optimize algorithms for post processing. Reda El-Arafy collecting ground samples in the Sinai desert. Once the samples and remote-sensor data were collected, El-Arafy divided his time between his two mentors, working alternatively with Parcak – most well-known for her work discovering new archeological dig sites using satellites – learning the intricacies of Earth observation data post-processing, and in the chemistry lab with Brande – a paleontologist and chemistry professor – to help analyze the composition of rock samples that El-Arafy personally collected in the study area. “Data from this area – the southwestern Sinai – is fairly sparse and these were the first samples collected from some sites. So the team didn’t know exactly what the detailed geochemistry would be.” recalled Brande. El-Arafy’s chemical analysis revealed that some secondary uranium mineralization in the southwestern Sinai was specifically associated with zones containing a concentration of iron oxide and clay minerals. While uranium cannot be directly detected from satellite sensors, these associated minerals have a distinct spectral signature that can be identified in satellite data. The final and most important step of the research was for El-Arafy to develop algorithms tuned to the shortwave and thermal-infra-red signatures of iron oxides and clay minerals as proxy indicators for uranium deposits in the southwestern Sinai. Once these algorithms were in place, the team could analyze satellite imagery in the study area to quickly identify unexplored locations with similar composition, finding new potential targets more quickly and cost-effectively. Over four years, using the data obtained from the advanced satellite sensors, El-Arafy built a system for identifying new potential targets for uranium exploration in the southwestern Sinai desert with impressive accuracy. Examples of three different satellite data composites of the same area, highlighting different features. Left image is a true colour composite, center and right images are false colour compositions. The success of El-Arafy’s studies parallels similar projects in the field of resource exploration using Earth observation data. Previously, the absence of standardized format and unified points of access for remote sensing data made it very difficult to deliver anything more than stand-alone analysis from remote-sensing imagery. But as algorithms are replacing eyeballs, the amount of information available will continue to grow with the resulting data being used in an increasing number of applications, from resource exploration to smart cities, precision agriculture, or investing. Get more Earth observations news, straight into your inbox.